Surfside BeachAll articles in the Surfside Beach section. 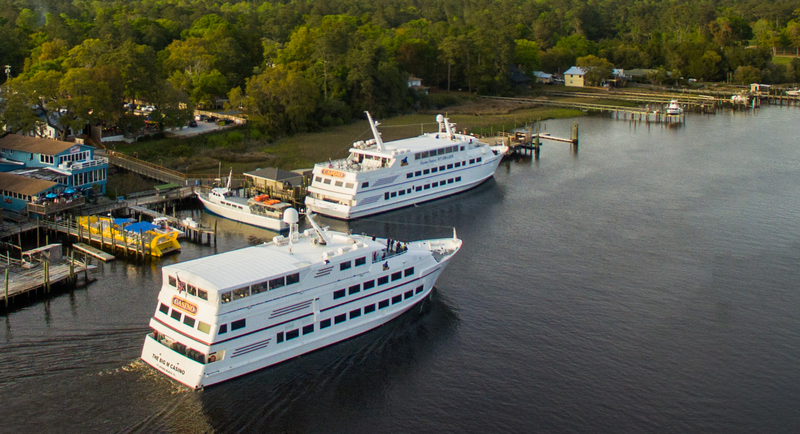 Aerial view of the two casino boats in Little River’s harbor. Cruises depart for international waters daily. The Big “M” Casino first arrived in South Carolina in 2008. 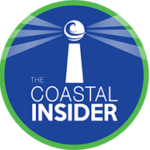 They have two luxury yachts that sail daily from Little River’s harbor. Aboard the boat, patrons enjoy dining, beautiful views, entertainment, camaraderie, and of course, gambling. 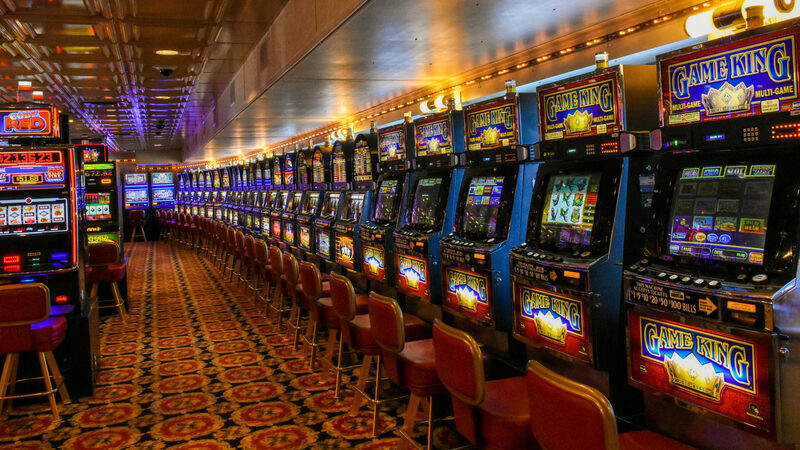 Land-based casinos are illegal in South Carolina. But three miles off shore, in international waters, those rules don’t apply. Twice a day, at 11am and 6:30pm, patrons board the The Big “M” Casino boat and sail from shore to try their luck at slot machines as well as table games like black jack, craps, roulette, let it ride, and three card poker. During the forty-five minute boat ride to and from international waters, The Big “M” entertains with live music, shows, or bingo depending on the day; and there is always the joy of being out on the open water with spectacular views. “We pay out an average of $336,000 in winnings per week,” says Eda Ekincigil, Marketing Coordinator for The Big “M” Casino. 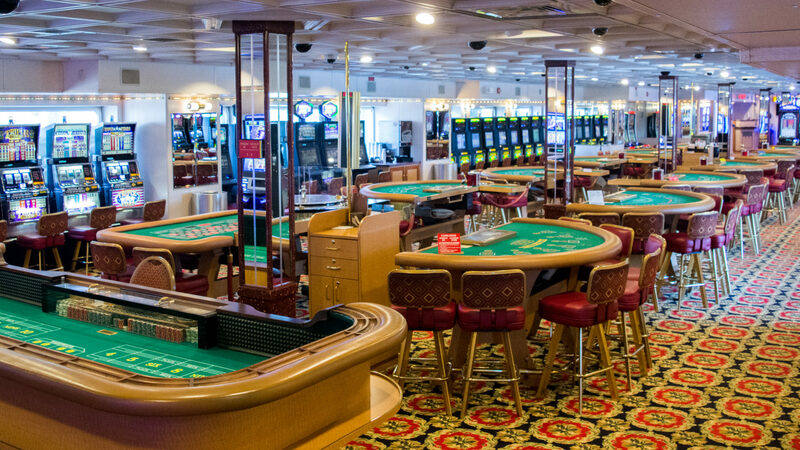 The first floor of the boat allows smoking and houses the main casino; the dining room and slot machines are located on the second, and is a non-smoking area; and the third level is the deck— which is partially enclosed, and allows smoking. The Big “M” has capacity for 450 people. Those aboard have three hours of playing time before the casino closes and the boat returns to Little River. “We pay out an average of $336,000 in winnings per week,” says Eda. The Big “M” offers many promotions. Those with a current military id can board for free, and receive a buy one get one free buffet voucher. Every Tuesday is Senior Day, with free boarding for everyone 55 years of age and up. Ladies Night is on Fridays, with free boarding and a buy one get one free buffet for ladies. No matter the promotion, everyone is required to pay the $10 port tax. You can also receive a Players Club card for free on your first visit which entitles you to a successive boarding for $10 no matter the time of day. Coupons for The Big “M” can be found in area publications, as well as on their website. Also check their website for their most current list of promotions, offerings, and sailing days and times. The first floor of the Big “M” Casino houses the main casino area. Our publication is all about what's happening in & around the Market Common. Advertising with us is in alignment with our mission; to connect community with local businesses. With our passion for connecting our community, we look forward to designing an ad for you to capture your unique voice. What's Happening In The Community? Publication independently owned and operated by Properties at the Market Common. Copyright ©, All Rights Reserved.